Married At First Sight: Ashley Petta & Anthony D'Amico Welcome Their First Child! Married At First Sight: Ashley Petta & Anthony D’Amico Welcome Their First Child! Who would have thought that a couple who met for the first time at the altar would actually end up in a lasting relationship? Experts matched Ashley Petta and Anthony D’Amico on Season 5 of Married at First Sight, which aired in 2017. After that, they appeared in the spin-off series Married At First Sight: Happily Ever After. The show documented their progress since the original series and something pretty special: Ashley’s pregnancy with their first child. In fact, all three couples from that season were expecting daughters and got to document their pregnancy. 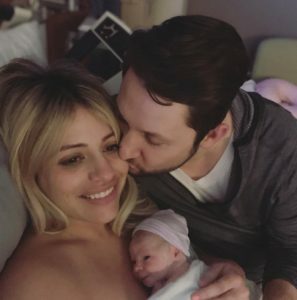 Now, it’s official: Ashley and Anthony are proud parents to a baby girl. The new dad continued, “So far I’ve kissed Mila about 7,000 times and counting. Love being a Dad it’s what I was meant to be. To say I’m in love with this little girl would be an understatement. There’s no words to describe. I can’t wait to watch her grow up and do all the fun Daddy, Daughter stuff! Our little family is one step closer to complete…” Was he hinting at the possibility of another child with that last part? It sure sounds like it. TELL US- DO YOU THINK THAT ASHLEY PETTA AND ANTHONY D’AMICO WILL BE GOOD PARENTS? DO YOU WANT THEM TO RETURN FOR ANOTHER SEASON OF MARRIED AT FIRST SIGHT: HAPPILY EVER AFTER? WHAT DO YOU THINK ABOUT THE NAME “MILA”?